Hanging Single Scoop Sugar Cone... / p.o.s. Our wall-mounted 4ft 99 Single Scoop Ice-cream, on sugar cone with flake, has a metal hanging frame so it can easily be attached to the wall of your shop, ice-cream parlour or kiosk. Single Scoop ICE-CREAM, 4ft Hanging Sugar-Cone with Flake point-of-sale display model. 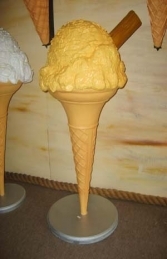 The 4ft tall replica Ice cream is fully 3D the model is made of high-quality, durable cold cast poly-resin & fibre-glass..not plastic, &, well cared, for will attract customers for many years to come. We do recommend that the ice cream statues should be lacquered or varnished if used outside. This 4ft high 3D Ice-cream display model is also available as a free-standing pavement model.